My fears that the Green Lantern titles were becoming increasingly interdependent on one another seem to have been invalidated as of Green Lantern #24. This is ironic, given that this issue is the first part of yet another crossover storyline between all of the Green Lantern books. Despite this, writer Robert Venditti takes care to establish the status quo for those readers completely unfamiliar with the series as well as readers like me who have only been reading one or two of the line. Impressive, he does this in the span of one page! Alas, I find myself with a whole new set of fears and worries regarding the future of my favorite franchise. Ignoring the metaphorical implications that Hope as a force is literally dead within the new DC Universe in the wake of the Blue Lanterns' destruction, I find myself troubled by the accusation of new villain Relic that the various Lantern Corps have been hastening the destruction of the universe just by existing. 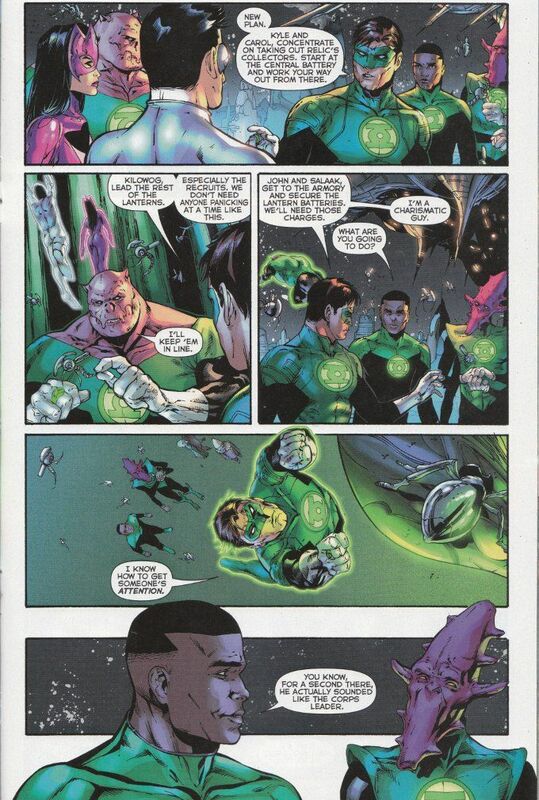 The idea that The Green Lanterns have been slowly destroying the universe for years is a troubling one and the suggestion our heroes would have been better off never becoming heroes spits in the face of the heroic spirit. That being said, this issue is incredibly well-written and enjoyable. Venditti sets up all this exposition without making it seem at like a lecture. Most impressively, there's some actual signs of character growth in the usually lackluster Hal Jordan. The artwork by Billy Tan and Rob Hunter is as impressive as the writing. Tan was born to pencil the Green Lantern series, having a real knack for depicting unusual aliens and amazing constructs. Hunter offers just the right amount of defining shadow amidst the light that dominates the artwork. I'm uncertain what the future holds for Green Lantern but that may not be an enitrely bad thing. The book may be heading into a depressing downward spiral but it is, I must admit, an engaging read in spite of that. For now, I shall hope that Relic is mistaken or lying and remember that old saying, "It is always darkest before the dawn."